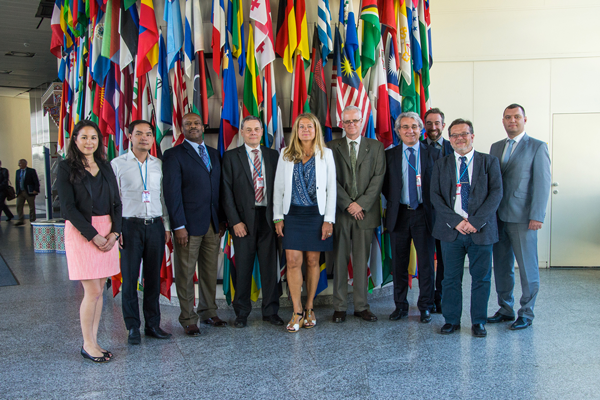 The TSOF Consultancy Meeting on developing technical and scientific capabilities of TSOs supporting regulatory functions in embarking countries took place at IAEA HQ in Vienna on 4-6 July, 2016. TSO Forum Consultancy Meeting to develop an action related to the capacity building of technical and scientific organisation of embarking countries was held at IAEA Headquarters in Vienna (Austria) on 4-6 July, 2016. As a follow-up of the TSO Conference in Beijing, the TSOF Steering Committee decided in March 2016 to develop an action related to the capacity building of technical and scientific organisation of embarking countries. As a first step a consultancy meeting was arranged by IAEA with the objective to share the experience and discuss among the experts from TSOF-members on their experiences with embarking countries needs in the field of TSO capability, review existing IAEA documents, missions and tools linked to TSO capabilities and provide recommendations for future steps. Besides representatives of CNSC (Canada), NRC (USA), JRC (EC), TSC/VARANS (Vietnam) and IAEA the meeting was attended by the experts of ETSON members – GRS (Germany), VTT (Finland), IRSN (France), SEC NRS (Russia) and ENSTTI. The experts presented their experience feedback in peer review missions and expert missions developed by IAEA (such as INIR, IRRS and other experts mission in capacity building) and other peer reviews and their experience feedback in developing support to TSOs for regulatory bodies of embarking countries. They developed proposals addressing the support of the technical and scientific capacity of TSOs in embarking countries and further steps for TSOF on related issues. Denis Mistryugov, SEC NRS, mistryugov@secnrs.ru.